Swallowing a tablespoon of sugar, drinking a glass of water upside-down, holding your breath, and having your neighbor scare you are not always the most practical of ways to rid yourself of hiccups. Hiccups are bothersome and difficult to get rid of, even with the help of the old wives’ tale remedies. Hiccups are not dangerous, just a bother. The current record for the longest time spent hiccupping is 68 years, held by Charles Osborn (Brainy History). So, what exactly are hiccups? There are several known causes. They are a protection mechanism of the body to rid the stomach of excess air. Other known causes include eating too fast, drinking excess amounts of alcohol, and emotional or stressful situations (WebMd, 2007). Hiccups occur when the diaphragm uncontrollably contracts, which causes a sharp inhalation of air, which is stopped when the vocal cords (glottis) close. 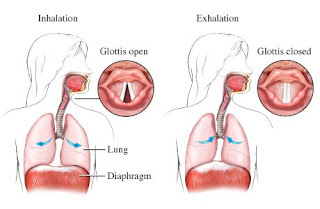 Closure of the glottis causes the air intake to be cut off, and a hiccup sound is heard. (Nucleus Communications, Inc, 2003). If you have ever been awakened in the middle of the night with an intense muscle spasm in your calf, you have experienced a phenomenon commonly known as a Charlie horse. These leg cramps are sudden, intense spasms or tightening of the muscles in the calf (they can also occur in the foot or less commonly, the thigh) (WebMd, 2006). Experts are not exactly sure what causes these nighttime cramps, but there are a variety of reasons postulated them. Getting too much exercise and overworking the muscles are one of the major causes. Diet can also play a role: if you are dehydrated or do not have enough calcium or potassium in your blood, your risk for Charlie horses increases. Other known causes include standing or sitting for a long period of time, especially in an awkward position, and having flat feet. The best remedy for a Charlie horse is to stretch and massage the muscle until the painful spasms cea se. The best ways to prevent a Charlie horse include drinking a lot of fluids throughout the day, and limiting alcohol and caffeine intake to prevent dehydration. Also, eating a balanced diet rich in potassium and calcium and getting sufficient exercise are ways of preventing Charlie horses (WebMd, 2006). Photo at left: Stretching is one of the best remedies for Charlie horses (http://www.fitsugar.com/1514844). A brain freeze, the common side effect from eating something really cold, such as ice cream, is an uncomfortable sensation that is difficult to get rid of. Brain freezes happen when something cold, such as ice cream, touches the nerves in the roof of the mouth (Hulihan, 1997). When these nerves are stimulated, they cause the blood vessels in the front of your head to constrict. This constriction leads to the painful sensation associated with a brain freeze (http://science.howstuffworks.com/question96.htm). There is not a cure fo r this phenomenon, but if you press your tongue to the roof of your mouth, this dulls the pain. The next best option is to just wait it out, until the constricted blood vessels fill again and the pain goes away. The nerves responsible for the painful brain freeze symptoms are shown in yellow in this image. These nerves are located in the top of the mouth, and constrict when something cold touches them. (http://www.bartleby.com/107/Images/large/image779.gif). Everyone has experienced the “pins and needles”, that tingling and sometimes painful feeling in an arm or a leg. Some people get a heavy feeling in their foot or leg, and others lose feeling completely. Contrary to common belief, this feeling is not caused by cutting off the blood supply to a body area. When you compress a body part for too long, the nerves located there are also compressed. The nerves are then unable to function properly and send messages back and forth from the brain (Hirsch, 2007). 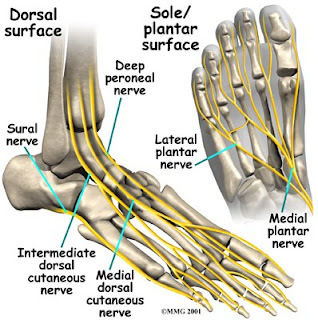 The nerves of the foot, a common body part to have fall asleep, are shown yellow in the photo at left (http://www.sportspodiatry.co.uk/foot_footanatomy.htm). As soon as you change positions, however, the nerves are free. They take a minute or two to readjust, which causes the pins and needles feeling associated with your leg or arm falling asleep. As soon as they resume connections with the brain, this feeling goes away (Hirsch, 2007). Eyelid twitching is a common phenomenon that usually occurs when one has been staring at a computer screen for a long period of time, or lacks sleep. Eye twitching is a spasm of the eyelids, in which the eyelid twitches uncontrollably. 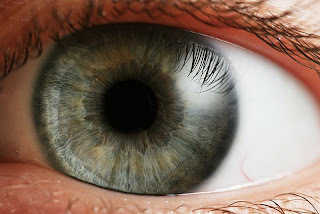 Medically known as “blepharospasm”, eye twitching is generally harmless (Eye Doctor Guide). Common eye twitching is known to be caused by stress, fatigue, eye strain, and dry eyes. The twitching itself is caused by a momentary abnormality in the part of the brain that controls the muscles of the eyes (Eye Doctor Guide). Eye twitching generally goes away on its own, but for severe cases Botox injections are recommended, which can relax the muscles around the eyes (Ray, 2007). Photo found www.funfacts.com.au/images/eye41.jpg. Brainy History. “Longest Attack of Hiccups”. Eye Doctor Guide. “Eye Twitching-What it is, Why you Get It, and How to Cope”. Hirsch, Lisa MD. “Why Does My Foot Fall Asleep?”. 2007. Ray, Crystal. Eyelid Twitching: Causes and Solutions. 2007. WebMd. “Nighttime Leg Cramps”. 2006.